The focus of our studies is on the formulation elementary reaction mechanisms in the condensed phase. Once formulated and validated, these mechanisms can then further be used in establishing elementary gas-phase reaction mechanisms. Our work involves both experiments and computations. The experiments consider both slow heating (e.g., 10K/min) and fast heating (2,000K/s to a set temperature) of small samples (sub-milligrams), in which evolved gas-phase species and residues are examined for their chemical changes. In the fast thermolysis experiments, gas-phase species are monitored by both Fourier-transform infrared (FTIR) spectroscopy time-of-flight mass spectrometry (ToFMS). Using the Bruker IFS/66s fast scanning FTIR spectrometer, spectra are usually acquired at 2 cm-1 spectral resolution and 20 spectra/s. Quantification occurs either by using the HITRAN data base or calibration. The ToFMS (R.M. Jordan system, differentially pumped in three separate chambers to create a molecular beam) can acquire spectra at rate of 50kHz, but is utilized to acquire spectra at an equivalent rate to the FTIR spectrometer. Using these two diagnostic systems provide a means for identifying the evolved species and to chart the temporal behavior of the species evolved. On the computational side, ab initio techniques are used to establish reaction pathways. The transition states are usually searched for by using well-known density functional techniques, such as B3LYP and various basis sets formulated by Pople. Intrinsic reaction coordinate (IRC) calculations are used to verify that the identified transition states (only one negative frequency) connects the reactants to the products. The condensed-phase calculations are generally assumed to occur in a solution phase, which tends to produce reasonable results for reactions involving or producing ionic species. Depending on the number of atoms involved, compound methods such as Gn or CBS-QB3, or coupled cluster methods coupled to a frequency calculation using DFT such CCSD(T,F)//B3LYP are used to improve the accuracy of the ab initio calculations. The compounds methods are usually used to compute the thermodynamic properties of enthalpy and Gibbs free energy. Once a reaction mechanism has been formulated, it is included in a model for conservation of mass and species. The predicted rate of species evolution is compared against measurements. If the agreement between predictions and measurements is reasonable, then the first step in the validation of the mechanism has been completed. Our work is currently supported by the Air Force Office of Scientific Research and the Army Research Office. ReaxFF simulation on the high-temperature, high-pressure combustion of a large polyaromatic hydrocarbon (PAH) mixture. Castro-Marcano, F. and van Duin, A., 2013. 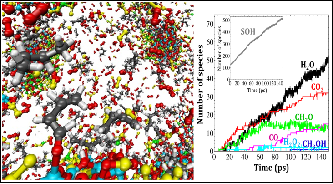 Comparison of thermal and catalytic cracking of hydrocarbon fuel from ReaxFF reactive molecular dynamics simulations. Combustion and Flame 160, 766-775. Castro-Marcano, F., Kamat, A. M., Russo, M. F., van Duin, A. C. T., and Mathews, J. P., 2012. Combustion of an Illinois No. 6 Coal Char Simulated Using an Atomistic Char Representation and the ReaxFF Reactive Force Field. Combustion and Flame 159, 1272-1285. Agrawalla, S. and van Duin, A. C. T., 2011. Development and Application of a ReaxFF Reactive Force Field for Hydrogen Combustion. Journal of Physical Chemistry A 115, 960-972. Weismiller, M. R., Russo, M. F., van Duin, A. C. T., and Yetter, R. A., 2013. 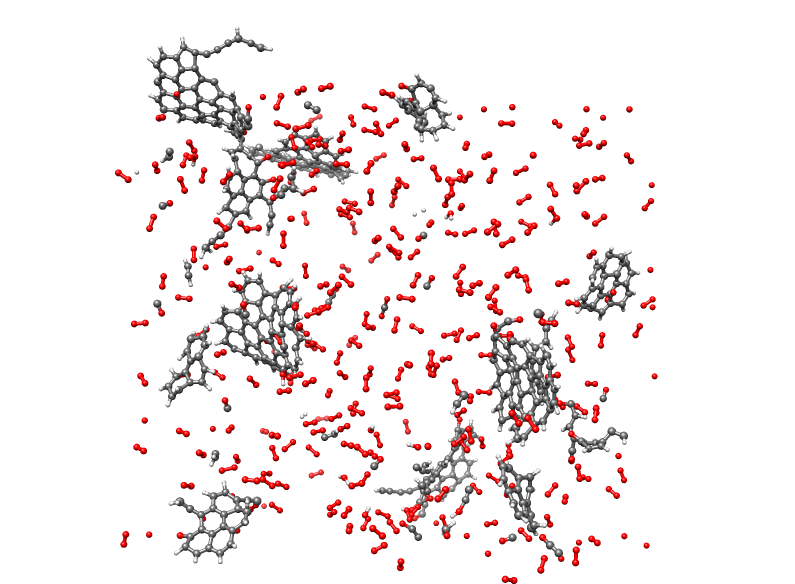 Using Molecular Dynamics Simulations with a ReaxFF Reactive Force Field to Develop a Kinetic Mechanism for Ammonia Borane Oxidation. Proceedings of the Combustion Institute 34, 3489-3497. Weismiller, M. R., van Duin, A. C. T., Lee, J., and Yetter, R. A., 2010. ReaxFF Reactive Force Field Development and Applications for Molecular Dynamics Simulations of Ammonia Borane Dehydrogenation and Combustion. J. Phys. Chem. A 114, 5485-5492. Chenoweth, K., van Duin, A. C. T., Dasgupta, S., and Goddard, W. A., 2009. Initiation Mechanisms and Kinetics of Pyrolysis and Combustion of JP-10 Hydrocarbon Jet Fuel. Journal of Physical Chemistry A 113, 1740-1746. Surface catalysis. We are using ReaxFF simulations to study a wide range of catalytic materials, including metals and metal oxides. ReaxFF allows us to perform fully reactive simulations on the gas/solid interface, allowing us to distill reaction mechanisms and provide analyses of complex surface catalysis structure evolution and chemical mechanisms. ReaxFF simulations of butane combustion on a pyrite-covered chromium oxide surface. Senftle, T., van Duin, A. C. T., and Janik, M., 2014. Determining In Situ Phases of a Nanoparticle Catalyst via Grand Canonical Monte Carlo Simulations with the ReaxFF Potential. Catalysis Communications 52, 72-77. Addou, R., Senftle, T., O’Connor, N., Janik, M., van Duin, A. C. T., and Batzill, M., 2014. 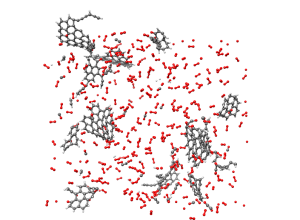 The influence of hydroxyls on Pd-atom mobility and clustering on rutile TiO2(011)-2×1. ACS Nano 8, 6321-6333. Senftle, T. P., Meyer, R. J., Janik, M. J., and van Duin, A. C. T., 2013. Development of a ReaxFF potential for Pd/O and application to Palladium oxide formation. Journal of Chemical Physics 139, 044109-1,044109-15. Zou, C., van Duin, A. C. T., and Sorescu, D., 2012. Theoretical investigation of hydrogen adsorption and dissociation on iron and iron carbide surfaces using the ReaxFF reactive force field method. Topics in Catalysis 55, 391-401. Zou, C. and van Duin, A. C. T., 2012. ReaxFF application to iron-based Fischer Tropsch-catalysis. Journal of Materials 64, 1426-1437. Chenoweth, K., van Duin, A. C. T., and Goddard, W. A., 2009. The ReaxFF Monte Carlo Reactive Dynamics Method for Predicting Atomistic Structures of Disordered Ceramics: Application to the Mo3VOx Catalyst. Angewandte Chemie-International Edition 48, 7630-7634. Chenoweth, K., van Duin, A. C. T., Persson, P., Cheng, M. J., Oxgaard, J., and Goddard, W. A., 2008. Development and application of a ReaxFF reactive force field for oxidative dehydrogenation on vanadium oxide catalysts. Journal of Physical Chemistry C 112, 14645-14654.